Apart from the silly Zune post, my last substantive communique suggested that Thor was angry with me, a post which upon a re-read had me feeling stupid and shameful. No, not because of the underlying events, but rather that despite having dutifully read my Edith Hamilton in college I bungled the mythology allusion. Thor has a hammer. It's Zeus with the lightning bolts. Duh. A quick review of Hedwig showed me the light. Things are . . . things. We are in the process of buying an awesome condo in the Hillcrest neighborhood of San Diego and the current plan is for Dia to move there around the 1st of July. I'm healing well from my unexpected surgery. My dear friend Suzi has told me, when asked how things are: "Well, I'm feeling feelings." Watch for Signs that Hell May Be Freezing Over . . . 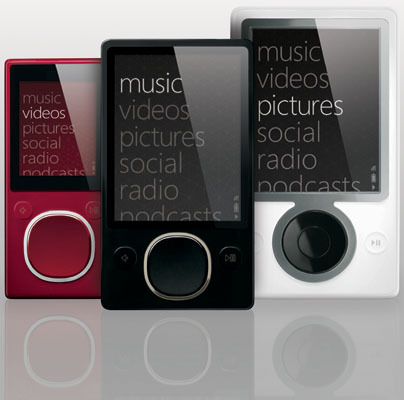 I just saw someone who I know--who does not work at Microsoft--listening to a Zune.